A grain-free formula for all life stages with peas and sweet potatoes provides highly digestible energy for your active cat. 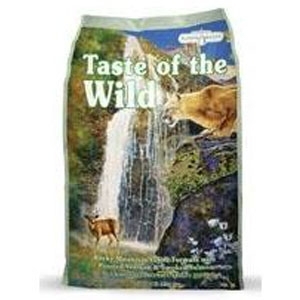 Made with real roasted venison and smoked salmon, this formula offers a taste sensation like no other. For today's healthy cat, this formula is supplemented with fruits and vegetables, providing natural antioxidants to support a healthy immune system and overall good health. Your cat craves a taste of the wild. Go ahead and give him one.